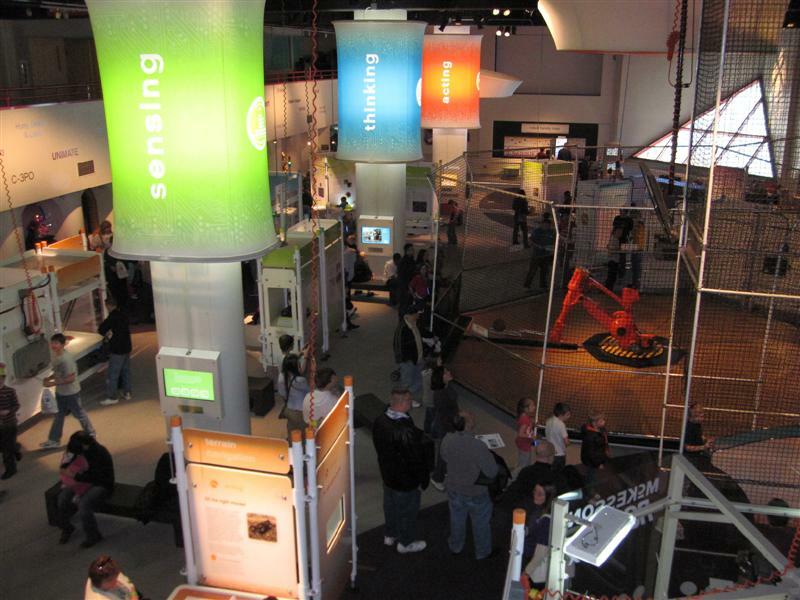 There are exhibits describing, replicating and demonstrating various concepts and technologies, like sonar range finders, radar, and “lidar” (long-range distance sensor for robotic vehicles). There was thermal imaging, object tracking systems, medical bots, and a robot mapping exhibit where you program a mobile robot across the floor through a course via touch-screen. 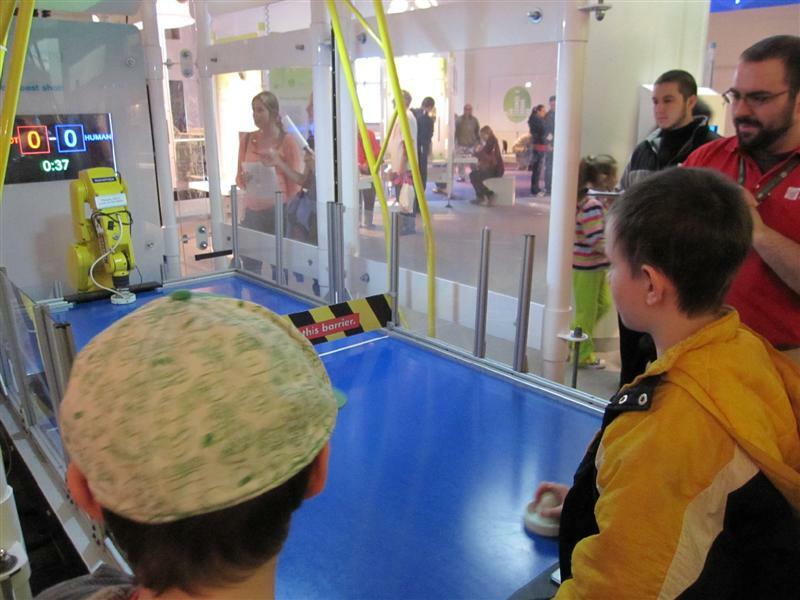 The Boy was mostly intrigued by air hockeybot, which plays air hockey against a human. He didn’t even want to play, so immersed was he in watching the robot and trying to figure it all out. The attendant told us that you can – occasionally — score goals against the bot, and recommended we check out the screen behind it. The information panel describes how it works via ultraviolet light. The robot’s disadvantage is that, despite its ability to predict the speed and direction of the puck, its arm cannot move as fast as a human’s arm. It IS possible to beat the Air Hockeybot. Of the few non-interactive exhibits, our favorite was “Hoops,” the giant robotic arm which shot basketballs into a regulation net. He shoots with 98% accuracy. He seems to have a cheeky personality which endeared us, by bowing repeatedly when he made his shot. It’s a 9! 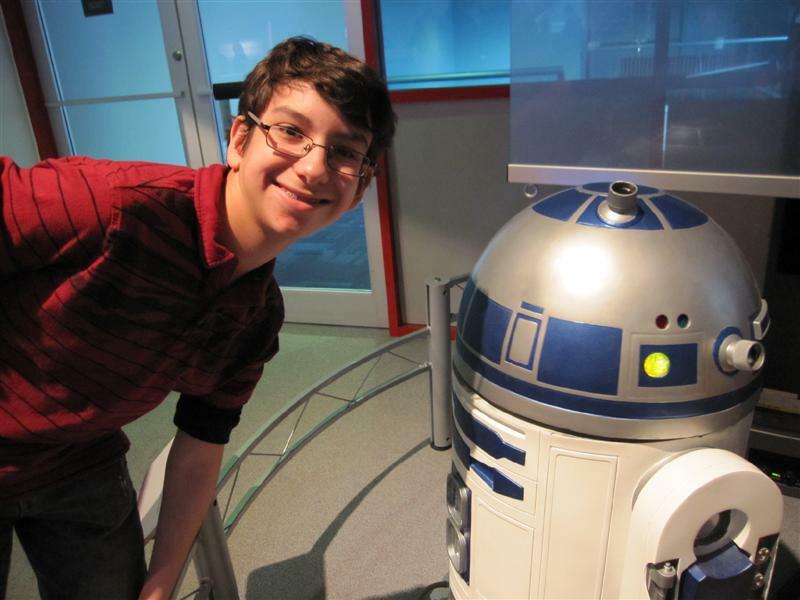 If you have even an ounce of geek in your blood, you will enjoy this exhibit. The only downside was the crowds, and the lines to interact with some of the more popular exhibits, like the air hockey table. 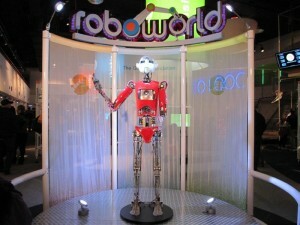 Disclaimer: Visit Pittsburgh provided us with complimentary admission to the Science Center. What an awesome exhibit. I have no computer geek tendencies at all and I want to go! Great post. Definitely!!! Total geek, this looks so awesome!!! How much does it cost to get in and what are the hours? Frostburg State University should do a field trip up there lol. I just put this on my “must see” list. I grew up near Pittsburgh and my parents still live there. It’s been a few years since we’ve been to the Carnegie Science Center. We definitely all have the geek gene in our family. It’s the Age of the Geek, Terri! Amazing exhibition. The future of robotics. Awesome day trip! My kids loved it- thanks for the inspiration to go!